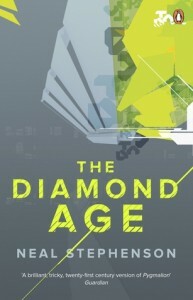 The Diamond Age is one of those frustrating novels which at its best tells a compelling story with fascinating ideas and memorable characters but fails to sustain that quality over an entire book and ends up being good but not as great as it could have been, a bit like the other Neal Stephenson novels I’ve read. One of the things that works well here is the setting, which manages to both be futuristic and also feel surprisingly topical for a book that’s almost twenty years old. A lot of the book is spent examining the impact of two technologies – the effects of widespread 3D printing on the global economy and the use of tablet computers in education of children. While early versions of both these technologies did exist back in the mid-90s I think Stephenson has done a good job of extrapolating from them, many of the issues brought up in the book will also frequently appear in modern-day news stories about the future of those technologies. Other aspects of the world-building are slightly less convincing; I think the idea of a New Victorian Age with some groups revisiting a past society as a way of dealing with a changing world is a reasonable one in principle but I’m not sure it ever quite manages to be believable. Admittedly, I’m not sure it was even meant to be believable or if it is just meant to be a fusion of steampunk and cyberpunk elements. One thing that does feel a bit dated is the portrayal of China as being somewhere lagging behind the new manufacturing revolution rather than leading it, I wonder if this might have been written differently if Stephenson wrote it now rather than two decades ago. The most memorable bit of technology in the book is the Young Lady’s Illustrated Primer, an intricately designed educational device in the form of a tablet computer which was destined for the young daughter of a senior Neo-Victorian lord but which ends up in the hands of Nell, a precocious young girl living a seemingly doomed existence in the Shanghai slums. Some of the highlights of the book come from the scenes where Nell is using the Primer and Stephenson shows some of his best writing in these scenes as he manages to somehow make compelling a storyline where a young girl plays an educational video game using a fairy tale world to educate her about technology. Nell is a likeable and fascinating protagonist and the book is at its best when focusing on her efforts to escape from her mother’s abusive boyfriends and her attempts to try to first fit in to Neo-Victorian society and later to find her own way in the world. There are also some good supporting characters, such as the Constable who acts as a mentor to Nell or the voice actress who records the Primer’s narration and sets off on a seemingly hopeless quest to try to find the girl she is helping the Primer to raise. Unfortunately, I found some of the other characters to be less interesting, and the novel often started to become less compelling when it moved away from Nell’s story and focused on other characters such as the Primer’s designer and his efforts to infiltrate a mysterious cult. I think some other characters could have benefited from a bit more time being spent on them, for example it might have been interesting to see more of the contrasts between Nell and the two other girls who get copies of the Primer. I think the book’s biggest problem is that having established a compelling premise and some interesting characters and ideas the book seems increasingly unsure about what to do with them (which seems a bit of a common problem in Stephenson’s books). New plot elements are introduced, principally a mysterious religious/technological cult known as the Drummers and Chinese revolutionaries marching on Shanghai, but unfortunately neither of the plot lines manages to be as compelling as Nell’s story and some parts of the plot start to get increasingly weird. The ending felt very rushed since key plot points were dealt with in fewer pages than some of the games Nell plays in the Primer and although I can see some of the points Stephenson was trying to make with the Drummers I still can’t say I entirely understand that particular plot or its resolution. The characterisation also suffers due to some large time jumps and some odd and poorly-explained decisions by some of the characters and it’s a pity that Nell seems to become less important to the story as it goes along. I thought there were some great bits in the book, and despite its flaws I’d definitely recommend it but with a caveat that ultimately the whole is somewhat less than the sum of its parts.